Netherlands-based charities select candidate projects from a pool of high potential research projects. Charities apply their proprietary analysis and selection procedures. In addition, ZonMw and other HUMAN+ Board members can present their projects to HUMAN+. As a charity presents its project to HUMAN+, they commit to co-fund a minimum of 33% of the project cost. HUMAN+ will be invited to co-fund 33% or more of the project cost, with the remaining 33% (or less) being sought from INKEF or other private funders. The HUMAN+ procedure starts with a check of the formal application requirements. In case the project fulfills the formal requirements, EATRIS performs a technical and translational feasibility check: the Translational Potential Assessment (TPA). Subsequently, the project and the outcomes of the TPA are presented to the Council of Experts to assess the investment potential. An investment decision is made. If positive proceed to final step. Monitoring project commences. During project execution, EATRIS is available for the project team for ’trouble shooting’. In order to fully utilize the charities’ knowledge and expertise, the HUMAN+ application starts with the charities’ proprietary assessment procedure. Key targets are research projects that achieved proof-of-principal and high potential preclinical outcomes. All charities are eligible to present their projects for co-funding. The application is presented by Netherlands’ based charities or one of the HUMAN+ founders. The application includes the commitment to co-fund the project for a minimum of 33% of the estimated project cost. The application includes a draft business plan in according to the HUMAN+ business plan template. The appendix of the business plan includes an extensive description of the scientific research outcomes. After assessment of the requirements and formal approval, EATRIS performs a Translational Potential Assessment (TPA). To avoid duplication and secure effective funding strategies, the TPA includes checking whether comparable projects are executed elsewhere in Europe or globally. EATRIS assesses the feasibility, the translational potential and prepares a summary report. The report is presented to the Council of Experts for further discussion and decision making. The HUMAN+ Council of Experts consists of delegates from a variety of disciplines. Their combined expertise secures an independent analysis and review of the applications. 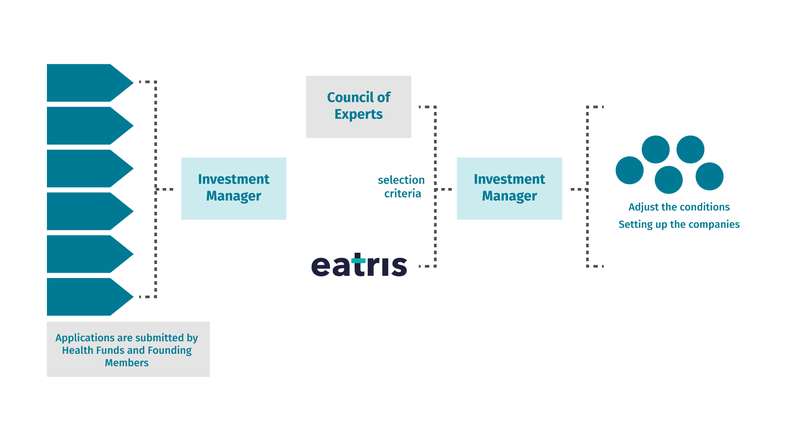 Taking the full application and EATRIS report into account, the Council of Experts will assess the investment potential: the required funding, confirmation of co-funding, expect returns, potential for patents, complementary scientific advice, etc. The findings by the Council of Experts are taken into account by the HUMAN+ fund manager for final analysis and decision making. Approved project applications will be transferred into a proprietary company structure. The company structure and legal entity strengthens the project structure and provides the basis to professionalize project management. A solid organizational structure and professional management fosters increased access potential to complementary funding sources. Each project company will be contracted, with stipulations regarding funding conditions, structural reporting, key performance indicators, monitoring and management requirements.